Cynicism reached new highs when it was noted that Chelsea employed the politician’s preferred tactic of choosing a good day to bury bad news, not once, but twice. First, the press release announcing the results, which was amusingly entitled “Chelsea Becomes Cash Positive”, was published on the final day of the January transfer window. Then, the detailed statutory accounts were published at the same time that new signing Fernando Torres was being presented to the press. 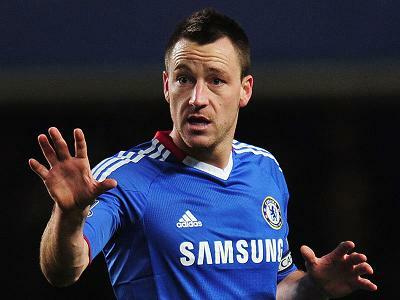 "JT - still the main man at Chelsea?" The “Back to the Future” return to the days of big spending appeared to signal a major change of heart from the club’s billionaire owner, Roman Abramovich, whose approach to the club’s finances over the last couple of years has been positively miserly by his previous munificent standards. Chelsea have hugely benefited from the Russian’s largesse in the past, but up until last month he had clamped down on expenditure, reducing the squad size by offloading experienced (expensive) players and cutting back on support staff. This new era of restraint was rationalised by the impending arrival of UEFA’s Financial Fair Play regulations, which should force clubs to spend only what they earn, especially as Abramovich has often been cited by UEFA President Michel Platini as one of the most enthusiastic supporters of the drive for clubs to be self-sufficient. On the face of it, Chelsea’s January splurge would seem to fly in the face of Abramovich’s backing for the new rules, particularly as reports indicate that Chelsea also had a £35 million bid for Bayern Munich striker Mario Gomez rejected, though it is not clear whether this would have been on top of the other purchases or was an insurance policy in case the Torres deal fell through. So, why did the loss increase, especially in a season when Chelsea secured their first League and Cup double? It’s all about the costs, as revenue is virtually unchanged, with wages being the main culprit, increasing by £20 million, though this was partially off-set by last season’s costs including £13 million severance payments to Luiz Felipe Scolari and his assistants. Last year Chelsea made £29 million profit on player sales, ironically mainly due to the transfer of Wayne Bridge and Tal Ben Haim to Manchester City (the “new Chelsea”) and Steve Sidwell to Aston Villa, while this year the sales of Andriy Shevchenko to Dynamo Kiev and Claudio Pizzaro to Werder Bremen generated a loss of £1 million. On the other hand, taking these players off the books helped reduce amortisation by £11 million. The wage bill has now reached a stratospheric £173 million, the highest ever reported by an English club, which is £40 million more than Manchester City and Manchester United (though it is certain that City’s wages will further increase this year) and £60 million more than Arsenal. The only two clubs with a higher payroll than Chelsea are the Spanish giants, Barcelona and Real Madrid, but their revenue is also considerably higher. 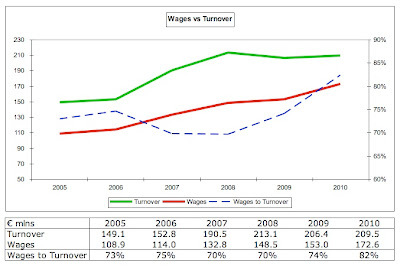 Nor does the important wages to turnover ratio, which has worsened from 70% to 82% in the last two years. This is considerably higher than all but one of their rivals for a Champions League place, the exception being Manchester City with a staggering 107%. Indeed, it’s nearly double the ratio at Manchester United and Arsenal. To get back to UEFA’s recommended maximum limit of 70%, Chelsea would have to cut the wage bill by £26 million – or grow revenue by £37 million. That might seem a steep task, given that there have been few signs of revenue growth in the last couple of seasons. Indeed, turnover has actually fallen by £4 million since 2008, though, as we shall see later there are avenues for Chelsea to grow their revenue in the future, which will help address some of the weaknesses in their current business model. To be fair, it’s not as if Chelsea’s revenue is too shabby at the moment. 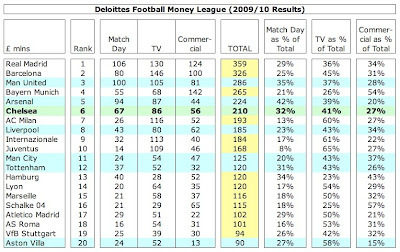 In the latest Deloittes Money League, based on 2009/10 results, Chelsea are very handily placed in sixth, which is the same as the previous season’s position. However, to place that into context, Chelsea’s annual turnover of £210 million is still a long way behind Real Madrid (£359 million), Barcelona (£326 million), Manchester United (£286 million) and Bayern Munich (£265 million), though it is within striking distance of Arsenal (£224 million). Nevertheless, it still came as a major surprise when Abramovich found his cheque book once again. In his first three years at the club, the oligarch’s spending spree amounted to an amazing £300 million (£150 million in the first year alone, when he essentially purchased an entire new team), but the net expenditure was negligible in the following four years. The last big investment occurred back in 2006, including the likes of Ashley Cole, Salomon Kalou and the ultimate vanity purchase, Andriy Shevchenko. This was very much in line with Kenyon’s assertion that, “We have consistently reduced our net transfer spend over the last five years and will continue this trend”, which was epitomised last summer when the only “big” names to arrive at Stamford Bridge were Yuri Zhirkov, Daniel Sturridge and Ross Turnbull (on a free transfer). Ron Gourlay repeated the need for a hair shirt policy in a team meeting at the start of the season, when he warned the players not to expect any major signings, as the club could no longer rely on handouts from Abramovich. Some commentators have speculated that the reason for Chelsea’s burst of activity is to somehow beat the UEFA Financial Fair Play rules, as the next set of accounts (2010/11) is the last year where the numbers are excluded from UEFA’s break-even calculations, but this merely betrays a lack of accounting knowledge. The reality is that when a player is purchased, his cost is capitalised on the balance sheet and is written-down (amortised) over the length of his contract. Importantly, this means that the cost of Chelsea’s recent purchases will be included under Financial Fair Play via the amortisation charge. In this way, amortisation can have a big influence on a club’s results. For example, Manchester City’s player amortisation has grown significantly from £6 million in 2007 to £71 million in 2010. On the other hand, the slow-down in Chelsea’s transfer spend has seen their amortisation fall from £83 million to £38 million in the last five years. Although a few journalists have suggested some accounting trickery, whereby clubs would choose to book all the huge transfer spend now as a cost, so that it would not impact future accounts, this seems extremely unlikely to me. While it is true that UEFA's regulations do allow football clubs to choose "an accounting policy to expense the costs of acquiring a player’s registration rather than capitalise them", the key point is that this must be "permitted under their national accounting practice." "Josh McEachran - a sign of things to come"
This is highly technical, but in my view this is where their argument falls down. 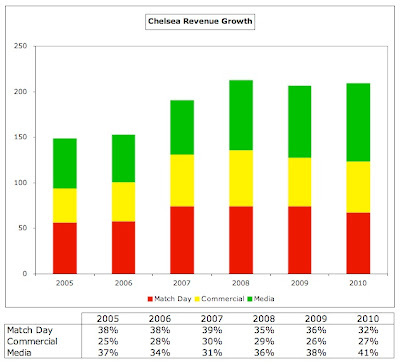 Ever since the introduction of IFRS (International Financial Reporting Standards), in particular FRS10 on Goodwill and Intangible Assets, major clubs have used the capitalisation and amortisation method to account for player transfers, so it would be difficult for Chelsea (or anybody else) to argue that the "income and expense" method had suddenly become appropriate. I suppose that there is always the possibility of a club booking a massive impairment provision in 2010/11, which would dramatically reduce the value of their players in the accounts, but have the advantage of reducing future expenses. However, this has the whiff of earnings manipulation and is unlikely to be accepted by UEFA. In fairness, UEFA have given clubs every opportunity to meet the new guidelines with a phased implementation. The first season that they will start monitoring clubs is 2013/14, but this will take into account losses made in the two preceding years, namely 2011/12 and 2012/13, so Chelsea’s accounts need to be in better shape pretty quickly. However, they don’t need to be absolutely perfect by then, as wealthy owners will be allowed to absorb aggregate losses (so-called “acceptable deviations”) of €45 million (£39 million), initially over two years and then over a three-year monitoring period, as long as they are willing to cover the deficit by making equity contributions. The maximum permitted loss then falls to €30 million (£26 million) from 2015/16 and will be further reduced from 2018/19 (to an unspecified amount). Note that these sums represent aggregate losses, not a yearly loss, as I have seen some people erroneously report. Indeed, Chelsea remained full of confidence, “The club is in a strong position to meet the challenges of UEFA financial fair play initiatives, which will be relevant to the financial statements to be released in early 2013”, i.e. their 2011/12 accounts. Obviously, many will take that assertion with a large pinch of salt, but, for once, I think that the club’s hierarchy might be right. My analysis indicates that Chelsea might well reach break-even sooner than many would believe. This is how I think they will do it, starting from their current pre-tax loss of £70 million. It is not widely appreciated that UEFA’s break-even calculation is not exactly the same as a club’s statutory accounts, as it excludes certain expenses, including depreciation on tangible fixed assets and expenditure on youth development and community development activities. In Chelsea’s case, this means that £9 million of depreciation can be removed right off the bat. It is more difficult to assess the youth development expenditure, as this is not separately disclosed in the public accounts, but we can make a reasonable estimate. In an interview with Frank Arnesen, Chelsea’s sporting director, who is due to leave the club at the end of the season, the Independent mentioned “Roman Abramovich’s £60 million plan to build Chelsea through youth development.” On the assumption that this cost refers to the amount spent by Arnesen during his five-year tenure, that would imply an annual budget of £12 million. To be conservative, I’m going to round that down to £10 million. Fortunately for Chelsea, UEFA still allow clubs to exclude such costs, regardless of whether the programme is successful, as to date the return on investment has not exactly been dazzling. However, there are some signs that it is beginning to deliver, most obviously in the form of skilful midfielder Josh McEachran, but also, to a certain extent, with Patrick van Aanholt, Jeffrey Bruma and Gaël Kakuta. The growing pool of talent resulted in Chelsea winning the FA Youth Cup last season. Either way, the Fair Play rules allow Chelsea to reduce their expenses by £19 million: £9 million depreciation and £10 million youth development expenditure. "David Luiz - Sideshow Bob"
The 2009/10 accounts ran up to 30 June 2010, so do not include the cost of any new signings after that date, which means that we need to add the wages and amortisation for Torres, Luiz, Ramires and Yossi Benayoun. Taking Torres as an example, his wages have been estimated at £150,000 a week, which works out to £8 million a year, while the annual amortisation is £9 million (£50 million transfer fee divided by the 5.5 years of his contract), giving a total of £17 million. Although players’ salaries are not divulged, we can make reasonably accurate estimates for the others, which give us a total of £36 million of additional costs for these four players. On the other hand, many high-earning players left last summer, which has taken at least £20 million off the wage bill, though this policy has also caused the club numerous problems on the pitch, as the young, emerging players are not yet ready to fill the boots of Ricardo Carvalho, Michael Ballack, Deco, Joe Cole and Juliano Belletti. A couple of lesser players (Franco Di Santo and Miroslav Stoch) also exited stage left, so my calculations suggest a reduction in wages of £23 million. Normally, players leaving would also lower amortisation, but these players were either out of contract or only had a small amount of time left, so I have not assumed any reduction for that. "Carvalho - first of the old guard to leave"
Although many of the players left Stamford Bridge on free transfers, Chelsea did receive money for some players: Carvalho £7 million, Stoch £4.6 million and Di Santo £1 million, giving a total of £13 million. As this year’s accounts included a loss of £1 million on player sales, that means an improvement of £14 million. Unless Chelsea repeat their feat from last year of winning the Premier League and FA Cup (or finally triumph in the Champions League), bonus payments should fall. These can significantly influence a football club’s expenses, as we have seen with Barcelona, who were in a financial sense victims of their own success, as they had to shell out around £33 million in bonuses. Furthermore, Chelsea have explicitly stated that they have cut performance bonuses, so there really should be a decrease here. Frankly, I have no idea how much this is worth, but for it to be meaningful enough for the club to mention it, it must be reasonably large. My estimate is £15 million (about 8% of the total remuneration), which does not seem too aggressive a target. 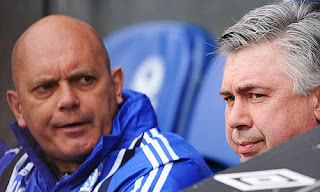 "Wilkins and Ancelotti - say hello, wave goodbye"
Against that, there will be a severance payment for Ray Wilkins, the former assistant manager, who left Chelsea in rather acrimonious circumstances in November. His deal was apparently worth £400,000 a year, but let’s be generous and assume a £1 million pay-off. If Abramovich tires of Ancelotti, there could be an additional “exceptional” payment here, but for the purpose of this exercise we’ll assume that “Carletto” will remain in place for the foreseeable future. That gives a net payroll improvement of £14 million (£15 million cut in bonuses less £1 million Wilkins payment). The latest accounts also reveal that Chelsea would be liable for an additional £3.8 million in National Insurance contributions if HM Revenue and Customs are successful in their legal case, where they argue that image rights payments should be taxed as income. As the outcome of that dispute is unclear, we shall ignore it in our workings. The signing of Torres will undoubtedly help the club’s commercial image, but Chelsea have already made great strides in what Gourlay described as “leveraging the brand.” In October, they signed an eight-year extension of their kit supplier deal with Adidas, which increased the annual payment by £8 million from £12 million to £20 million. In fact, some reports suggest that the new agreement could be worth as much as £25-30 million, but this is almost certainly linked to on-field success, so I have taken the lower amount. Similarly, at the end of last season, the club agreed a new deal with shirt sponsor Samsung, which reportedly increased the annual fee by £4 million from £10 million to £14 million. 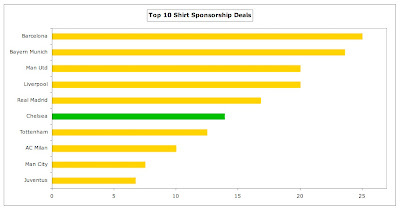 That’s pretty impressive, meaning that Chelsea now have the sixth most lucrative shirt sponsorship deal globally, though it’s still a fair way behind the £20 million earned by domestic rivals Manchester United (Aon) and Liverpool (Standard Chartered). Of course, Barcelona’s £25 million deal with the Qatar Foundation has raised the bar again - even higher than Bayern Munich’s £24 million deal with Deutsche Telekom. So, in total, there should be a hefty increase of at least £12 million from commercial deals (Adidas £8 million, Samsung £4 million). This is the figure I have used in my plan, even though other new contracts, like the one signed with Singha beer will also have grown commercial income. Chelsea’s current total of £56 million is £25 million behind Manchester United, but this rash of new deals is closing the gap. They are keen to further exploit their commercial potential, hence they will embark on a tour of Asia next summer in order to tap into emerging markets, but they would need to hugely up their game if they want to get close to Bayern Munich’s astonishing £142 million. This is, of course, the area where those fans that have not bothered to plough through UEFA’s regulations (and who can blame them?) see an easy way to reach the break-even target. Why doesn’t Abramovich sign a £200 million sponsorship deal? Or pay £50 million a season for a super-VIP executive box? Or buy 10 million shirts emblazoned with “Torres 9”? Unfortunately, that simply is not possible, as UEFA have introduced the concept of “fair value” so beloved of tax authorities when reviewing inter-company transactions. In short, if an owner over-pays for services, this will be adjusted down to market value, i.e. what the club would have received if the transactions were conducted on an “arm’s length” basis. Obviously, there is still some scope for manipulation, especially as market value is notoriously difficult to assess, but the most blatant excesses should be prevented. Staying with the commercial arm, there has long been talk of Chelsea selling naming rights for their Stamford Bridge stadium. This is easier said than done, especially as the best marketing opportunity really lies with a move to a brand new stadium, but analysts have spoken of £10 million per annum, which is not beyond the realms of possibility. Indeed, Ben Wells, the club’s head of marketing, has waxed lyrical about looking to Asia for a sponsor, building on the club’s existing relationships in the region. Chelsea raised their ticket prices at the beginning of this season. Although this is never going to be a popular move with fans, in fairness, this followed four consecutive seasons of freezing prices and was the first increase since July 2005. After inflation is taken into account, the club claimed that this represented a reduction in real terms of 15% over the period. Some accounts list the increase this year as an average 4%, while others refer to a 10% increase in season ticket prices, so I have again used a conservative assumption of 5%, which would be worth £3 million a year. The club is limited in its ability to generate more match day revenue, because of the low 42,000 capacity of Stamford Bridge, which is considerably smaller than Old Trafford (76,000) and the Emirates (60,000). To be fair, they do get a lot of bang for their buck (yield per seat), as can be seen by the fact that their match day revenue of £67 million is much higher than Liverpool’s £43 million, even though Anfield’s capacity is actually larger at 45,000. However, they still earn over a £1 million less per match than Manchester United and Arsenal. Their only realistic hope of matching the £100 million earned by those two clubs would be to move to a larger stadium. Although such a project did appear to have been taken off the agenda, a couple of months ago the idea of moving to a new 60,000 capacity stadium in the nearby Earls Court Exhibition Centre was again floated. Chelsea looked at the same site four years ago, so this is very far from a fait accompli, but the area is not exactly flush with alternatives. 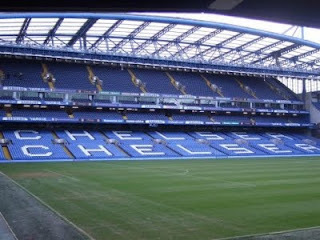 As chairman Bruce Buck said, “Certainly we wouldn’t leave West London or thereabouts, and there are very few sites available.” However, there would be many hurdles to overcome, including planning permission, and a new stadium would not be ready until 2015, so this is very much future music. In line with other Premier League clubs, the main driver of revenue growth at Chelsea has been television, which is particularly evident in 2007/08, when £17 million of the £23 million increase in turnover was attributable to the new three-year deal with Sky. In the same way, the 2010/11 figures will be given an uplift by the latest three-year agreement, which kicked-off this season. Thanks to the overseas rights more than doubling, this is anticipated to deliver between £7 million and £10 million additional revenue to each club. Given that the actual amount received is partly dependent on the final league position and the number of times the team is broadcast live, I have used the lower figure in my plan. In the same way, the distribution of Champions League prize money and TV payouts will also be higher this season. Again, this is dependent on a number of factors, such as how far a team progresses in the competition, how many times they win in the group stage and the share of the market (TV) pool, but an assumption of an additional £5 million is probably not too wide of the mark. This is probably the main reason why Chelsea bought Torres and Luiz, as for the first time in ages there is a very real risk that they might miss out on Champions League qualification and the money that accompanies that. Simply put, the £71 million will be a price worth paying if it guarantees qualification. Of course, there’s no such guarantee in the unreliable world of football, but this statement of intent should surely help, not least in the boost it will give to the rest of the dressing room. So, adding up all those ups and downs brings us (spookily) to break-even. The key point here is that all of these actions have already happened with the sole exception of the naming rights, so it is little wonder that Chelsea’s officials demonstrated such confidence when announcing their latest loss. Of course, there may be other factors affecting the club’s financials, but remember that the acceptable deviations will give them plenty of room to manoeuvre. Those of a more Machiavellian nature would no doubt maintain that all of this is unnecessary, as Chelsea could just employ an army of lawyers and accountant to locate the loopholes in UEFA’s regulations, but the figures above suggest that they do not actually need to resort to such subterfuge. In any case, UEFA are not complete fools, as they have addressed some of the more obvious ways of getting around the new regulations. Another possibility that some have proposed is for a club to sell a player to a “friendly” club at an inflated price, thus producing a large profit on sale. This is more difficult to police, as transfer prices on occasions appear to defy logic, e.g. a few weeks ago not many supporters would have believed that Andy Carroll would have fetched £35 million, but if this were to become a recurring theme at any club, it would be easily identifiable. Interestingly, it does look as if UEFA are operating a “carrot and stick” approach to implementing the new regulations, as the small print in the last appendix provides a further safety net or, as Traverso described it, “a little bit of a cushion”. Even if a club misses the target, it can escape sanctions if it meets two criteria: the trend of losses is improving; and the over-spend is caused by the wages of players that were contracted before June 2010 (when the fair play rules were approved). However, that flexibility is only available for the reporting period ending in 2012, so effectively only delays the day of judgment by a year. This begs the question of whether UEFA really would exclude clubs from European competitions. This might work fine on paper, but it might never happen in reality, especially when you consider that some of Europe’s least profitable teams are among those that attract the largest television audiences. 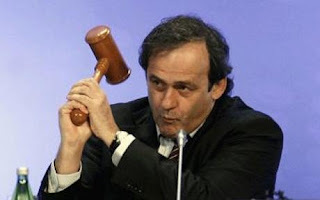 "Michel Platini - it's Hammer time"
At this stage, we should probably clear up yet another misconception about the Fair Play regulations. Many seem to believe that if a club has no debt, it should be OK, but that is not the most important issue for UEFA, who are less concerned about clubs taking on debt, but more their ability to service that debt, i.e. pay the annual interest charges. Some thought that this was the reason that Abramovich converted his £726 million of loans into equity (at least in the football club, though not in the holding company, Fordstam Limited), but in reality this makes no difference to UEFA. That said, there’s no doubt that Chelsea have gained from their owner injecting funds into the club, not just for the obvious reason that it has provided a lot of money, but also because the loans were interest-free. That’s given the Blues a considerable competitive advantage over their main rivals, who have all incurred immense annual interest charges: Manchester United £70 million, Liverpool £40 million and Arsenal £20 million. "Abramovich - good to be back"
Chelsea’s fortunes have been inextricably linked to those of Abramovich since he started bankrolling the club in 2003. Although he was affected by the global recession, his wealth is still estimated at £7.4 billion by the Sunday Times Rich List, so lack of money is unlikely to be an issue for him. The more pertinent question for Chelsea fans is whether he still retains the same enthusiasm for the club, particularly as he has been involved in Russia’s successful campaign to host the 2018 World Cup. Last month’s venture into the transfer market might well allay supporters’ fears, though the suspicion remains that this could instead be a last throw of the dice in order to win the Champions League in the next two seasons. We shall see, though Abramovich has been true to his word so far. Well, yes, but the only reason that the club had a (small) positive cash inflow of £3.8 million in 2009/10, compared to a net outflow of £16.9 million in the previous year, was that there was an £18 million cash inflow from transfers. In every other year of the Abramovich era, the club has had significant cash outflows and has needed to be financed by their owner, either though new loans or subscribing for additional shares. It will be very interesting to see what happens next summer. There is now a distinct possibility that Abramovich will finance further rejuvenation of an ageing squad with exciting names like Anderlecht’s powerful young striker Romelu Lukaku, Lille’s creative midfielder Eden Hazard and Udinese winger Alexis Sanchez being mentioned in dispatches. "Didier Drogba - on his way?" Conversely, this may well be compensated by the club moving on a few players, not just those on the fringe of the first team like Paulo Ferreira, John Obi Mikel and Yuri Zhirkov, but also some of the big stars like Florent Malouda and even Didier Drogba. The resale value may be low, given their age, but such actions would have the benefit of slashing the wage bill and reducing amortisation. If Chelsea do go on a summer spending spree without recouping some of their expenditure, then all bets could be off in terms of Financial Fair Play. However, up until now, it looks to me as if they have been boxing rather more cleverly than many people have assumed. As we have seen, they are indeed well on course to break-even, despite the astonishing expenditure in January, and there is evidently some method in their apparent madness. Your points 1-10 are mostly ongoing year-after-year recurring ways that profits can be improved, but point 4, the £13m cash received for Carvalho etc, is surely a one-off that won't repeat, and so it shouldn't be included in your list of ongoing potential profit improvements? Is a figure/estimate of how much wages relate to contracts dated before 1 June 2010 relevant, to add back in the early years? Yes, it's true that profit on sales are once-off, but last year's loss on player sales was very much an exception. Chelsea averaged £25m profit in the preceding two seasons. Even if we go back a further two years, the average is £17 million, so I don't think it's unreasonable to assume £13 million going forward. I mentioned the pre-June 2010 wages in the text. This would be relevant to the first year's break-even calculation, but probably not the years after that. It's difficult to be definitive on that one, as the wording in the regulations is not completely clear. IMHO, I believe if Abramovich still has the love & passion for the club then meeting these rules aren't that hard. What if Abramovich or his wife or daughter buys Chelsea players match shirts and boots for say 100 million and this increases the income and helps to balance the book. then in future when Chelsea has enough profits, pay back by re-buying those memorabilia. Since Roman is the SOLE owner isn't this a possibility? Just wondering, I mean this could sound silly but nothing in this is unfair isn't it? expecting your expert view on this. A wonderful analysis as ever; makes mine feel impotent by comparison. 1. Chelsea has an ageing squad with players such as Cole, Terry, Lampard, Anelka, Drogba and Malouda all over the 30 mark. This must mean that if they want to continue winning they need new signings (if the youth system does not work). This will lead to increased costs in the future. Probably some of these will still be signed while high paid players such as Terry and Lampard are still at the club. High wages for a couple of years might be the result as well. 2. Tor Kristian Karlsen (@karlsentk on twitter) is claiming that sources are telling him that Chelsea are looking to sign 4-5 good players in the summer. If not 4-5 the indications are that they will keep spending and therefore increasing costs. This is just "talk", but I guess you might know karlsentk and that he is a reliable source on matters such as this. All of this points towards Chelsea spending highly the next two seasons and this will really get them into trouble. Thanks for the kind words. This is where the concept of "fair value" is applicable. The second part of point 6 above on Commercial Deals explains that such "sweetheart" deals are not allowed. I agree that they will need more new players to replace the elder citizens in their squad, which will obviously increase both wages and amortisation. For example, 5 new players at £20 million a piece would increase annual amortisation by £20 million (assuming 5-year contracts) plus another £18 million in wages (assuming £70k a week). Against that, they would reduce their wage bill be moving out some of the older/fringe players, which might also have a positive effect on amortisation. Without knowing the exact figures, it is difficult to calculate the net impact, but it is likely to be a net increase in costs. That would still be OK, if the losses were within the acceptable deviation. I did cover this towards the end of the piece as a possible eventuality. SR thank you for another tremendous piece. With reference to Torres' length of contract in particular, do you think the 5.5 years is as much the bean counters influence to ammortise his high transfer value over many periods as for footballing reasons? I mean he'll be 33 by contracts end and statistacally a striker's sell on value begins to erode from age 28 onwards. From a medical point of view, surely such a long contract for a player who had 2 knee operations last year seems risky? Incidently on the same day Suarez, Carroll and Luiz all signed 5.5yr deals too. Do you think this is a coincidence? I'm not sure if i remember so many long contracts before the fuss over the FFP brewed. Big question is, what will happen if Chelsea does not qualify for the Champions League next year??? Looking at their finances and the state they are in, Champions League is an absolute must (mainly for financial reasons). Without CL, it will be a downward spiral for them. And it is possible that Chelsea ends up without CL as they are fighting for 1 automatic spot and 1 qualifier with Man City and Spurs. Failure to qualify for CL does not only means no CL money, but also less match day revenues, less TV revenues, less commercial revenues, less attractive for big players, etc etc etc while the cost remains. Smaller question, can a club increase the amortisation period of a player when they sign a new extension to their contract? I would say it is possible, as it is possible to increase the life of an asset if the lifetime of it is extended. If that is the case, then expect clubs to extend the contract of their players (especially the ones bought expensively) so that the amortisation cost will go down. Do you think there will be an increase in the use of special purpose entities to get around some of the FFP rules? Great post. A very specific question about amortization and player contracts. Using Didier Drogba as a specific example, does his amortization period extend when he signs a new contract? He joined Chelsea in 2004, originally on a 4-year contract (I think), and signed a further 3-year contract in August 2009. So are Chelsea still booking amortization each year for his initial transfer fee, or does it end when the initial deal ends? It's of interest, because I would imagine it would impact the amount that would come off their books if he were to move on to Marseille (or elsewhere in the summer), whereas players like Zurkhov and Malouda would represent larger reductions because they'd represent a reduction in wages and amortization. I'm still really fuzzy on amortization, so appreciate your clarifications on this topic. Would be interested to know how this would impact Arsenal's costs in regards to handing Arshavin or Nasri new contracts as well. If there annual amortization costs are coming off the books, does that give Arsenal more leeway to increase their wages, and still have each player represent less of an annual cost? Champions league will be key for all big clubs. Very few big clubs will be able to break even without CL. I think that Chelsea will let some of their older players go and some of their younger players will sign new extensions. I think that player remaining amortization gets spread over a longer period when the player signs a contract extension. Branislav Ivanovic just signed an extension and his yearly amortization went from 2.75 to 0.75. I think this will happen with a lot of players. 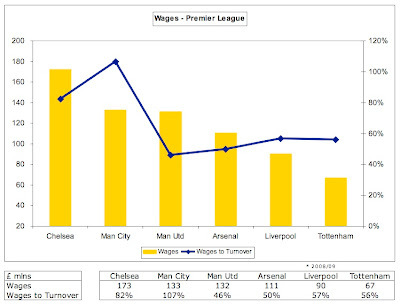 Also, Chelsea has been a club that pays huge wages recently. I think that new younger players will probably save the club a significant amount on wages compared to players that will be sold (or let go on a Bosman). I agree that the Torres and Luiz deals are probably last ditch attempts to make CL this year and next year. Without CL, Chelsea is in big trouble with FFP rules. Also, when compared to the other big league, the EPL has more big clubs that can qualify for CL next year and in future years (Chelsea, Man City, ManU, Tottenham, Arsenal, and Liverpool - yes even Liverpool). 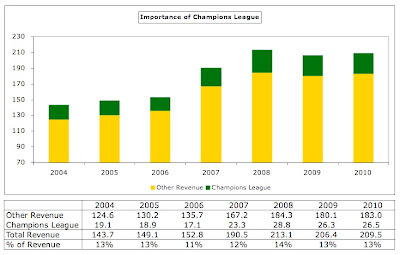 This is primarily due to the revenue of these clubs. Chelsea may not make CL this year. This year, they still have to play ManU twice and are 3 points behind Tottenham (albeit with a game in hand). If they make it next year and break even in 2012-2013, they could use the quantam trend caveat to make an argument (and I think this will work if they break even). That's certainly a possibility and I have detected a trend towards longer contracts. Whether that is due to FFP or an attempt to ensure that the club can still obtain a good fee if the player is transferred, I don't know. I am sure that your are right. The Champions league makes an enormous difference to a club's financials, which makes the transfer spend more understandable. If a player's contract is extended, any remaining written-down value is amortised over the extended period, which means that the annual amortisation will reduce. Example: a player is bought for £40m on a 4-year contract, so the annual amortisation is £10m. After 2 years, his contract is extended by a further 2 years, meaning that he now has 4 years left on his contract. At the point of renegotiation, his value was £20m (£40m cost less 2 years amortisation @ £10m). The new amortisation charge would be £5m a year (the remaining £20m divided by the 4 years now left on the contract). In this way, clubs can lower their amrtisation charge. In his example, Pavget gave an example of this with Ivanovic. I don't know all the contract details for Drogba, but, based on the dates you provided, he would have been fully amortised in 2008 (4 years after he signed in 2004), so the fact that he extended his contract in 2009 has no effect on amortisation. It's possible, I guess, but the business of football clubs is so simple that I'm not sure it would be very effective. Thanks for clarification on amortization (I'll keep spelling it the American way) periods. That makes sense. Failure to qualify for the Champions League wil make a very big difference in income, but the irony is that FFP relates to qualifying for Uefa competition, so if Chelsea don't qualify then the finance numbers don't matter! Except of course if Chelsea re-qualify for Uefa tournaments, when the previous years with no Uefa income and a still-high cost base will damage their ability to meet the criteria. Could Chelsea simply generate revenue through Abramovich buying/sponsoring a box at Stamford Bridge through his oil firm and paying millions for the privelege? No. This is covered in section 6 of the article on "Improved Commercial Deals". Nice article! I should read your blog more often. If UEFA are keen on using consolidated accounts to judge the FFP then surely Chelsea FC would have to be part of a larger group; 'Fordstam Limited Group'? This would appear to be the entity of interest as Chelsea FC as a stand-alone company are not financially viable - as they state in their own accounts (reliant on Fordstam Limited for financial support). If this was the case then the 700m of debt in Fordstam would also have to be converted to equity by Abramovic else it would need to be added into the calculations. Annex VII is not totally clear on this, and it seems chelsea might simply be able to say the reporting group starts with Chelsea FC and ignore the parent. Surely this opens a large loophole though. b) net debt exceeds 100% of total revenue." this triggers further investigation by UEFA at any time, so the 700m debt would definitely need to be equity and the level of wages at 82% of turnover would be an issue going forward. I think many clubs will have an issue with 62(4) one way or another. The break-even might be slightly easier to tweak due to the equity switch or interest-free loan route of financing, and longer contracts for players. The point here is that 62(4) doesn't seem to have any sanctions applicable to it, as long as clubs meet 62(3), the break-even requirement, then they are deemed to be compliant. ...I'm reading through the annexes as I write this: dividends included as expenses, (Annex X, 3.1.e)interesting move...not that many clubs pay dividends any more but they are a distribution of profits not an expense...that's going to pretty much abolish them completely for football clubs - blatant double counting! As you say, it's still not entirely clear which entity will be used, but I tend to agree with you that UEFA will probably use the parent company, Fordstam Limited Group, as the basis for the break-even calculations, though the difference compared to Chelsea FC PLC is immaterial in terms of the P&L (£3m in 2009) and some of those differences may be excluded from UEFA's template anyway, as they are not relevant income or expenses. The other reason that I used the PLC accounts is that they have been published, while we are still awaiting Fordstam. Nor do I think that the debt held in Fordstam is a big issue. As you rightly point out, if a club breaches the guideline on debt (or indeed the wages to turnover ratio), then it does not face automatic sanctions, but is merely requested to send additional information. Thanks for the great blog - it's the best site out there for this sort of thing and I find your work fascinating. If Chelsea break even on the above calculations, then I can't see how they can invest in the squad for the 4 or 5 players. I know you're suggesting above that they would move players on (i.e. Drogba, Malouda and Terry) which would free up wage space, but wouldn't necessarily free up the requisite capital for expenditure immediately. And I wondered if it would be possible for you to do a quick comparison table of the top 6 premier league teams (Man Utd, Arsenal, Man City, Spurs, Chelsea and Liverpool) comparing their total revenue including the breakdown for european tv money? My basic question is whether someone else could make up for the shortfall (e.g. 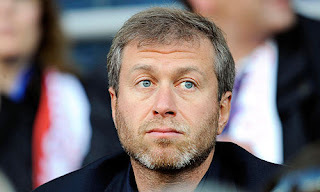 Mr Abramovich's friend) and then sell their shares to the owner? I don't think that Chelsea's issue is lack of capital. In the past, whenever there has been a shortage of funds, this has been covered by the owner. This would not be a major problem under FFP. The Champions League revenue depends on a number of variables, but, to give you an idea, last season's central distributions from UEFA were: Man Utd €45.8m, Arsenal €33.4m, Chelsea €32.2m and Liverpool €28.9m. On top of that, there are additional gate receipts and commercial income. The regulations state that the deficit can be covered by contributions from "equity participants and/or related parties." There are some criteria for who can be considered as a related party, so it must be someone with some sort of control or influence over the club. Excellent analysis, as ever. I do come away from reading it, though, wondering whether it is a case of Chelsea being smart or of UEFA's FFP being dumber than we'd thought. once again a very interesting read - thank you. I was wondering if you could explain just how damaging missing out on the Champions League would be to Chelsea in relation to Europa League qualification, assuming it were a one-off event. "To my mind, there are five revenue streams: (a) participation and performance; (b) television; (c) match day; (d) sponsorship; (e) increase in value of the squad." Chelsea are already tied down to long term sponsorship deals which presumably guarantee them money regardless of performance, at least to some extent. The value of the squad probably effects Chelsea less since they have a squad of experienced internationals whose perceived class, and therefore value, would presumably not be affected too significantly by one season of poorer form. In terms of match day revenue I suppose ticket prices would have to be reduced, but the relatively small capacity of Stamford Bridge would presumably mean that they could still attract capacity or near-capacity crowds for the Europa League fixtures. They would probably go far in the competition and probably with a good win percentage along the way so performance/participation bonuses might be near maximum possible. But presumably those figures and the television income would be very seriously affected since there just isn't the demand for Europa League in the same way and hence less money involved. So how much less than the ~£50 million you suggested the CL is worth to Arsenal would the Europa League be worth to Chelsea? I have no idea of the figures so maybe you could clarify? Excellent Work, which is quickly becoming the norm for you, but I was hoping you could answer a question I have on a different club. I read an article online that talked about the distinct possibly of Grasshopper Club leaving Zurich due to problems in securing a new stadium and being burdened with stadium costs at Letzigrund. As someone in Switzerland, how much of a possibility would this be? I know the Super Axpo League isn't one of the big boys, but I was hoping you could shed some light on this for me. Just heard you on Beyond The Pitch and you were excellent, thorough, engaging and very clear. It's so refreshing to hear someone talk about complicated issues without dumbing it down. What I meant about the capital question was, say for example, Chelsea make a net expenditure of £100 million this summer in transfer fees. Would Chelsea not then need to make £100 million in "savings" elsewhere to balance the books. i.e. how on earth are Chelsea realistically going to both balance the books and bring in the new players their squad will need? Very possible. According to this week's press, GC have given notice of their intention to leave the Letzigrund in Zurich and either move to Aarau or Emmenbrücke, though nothing is yet definitive. Thanks. Second time I've been on Beyond the Pitch - always a pleasure. There's a difference between the transfer spend and the impact on the profit & loss account. So, if Chelsea were to spend £100m in the summer, this would only impact the P&L via amortisation (and obviously wages). If the average length of the new contracts were 5 years, the amortisation impact would be £20m, so the savings would not have to be as high as the £100m cash outlay - at least in terms of FFP. There are many variables, but perhaps this stat will help explain the difference: last season Chelsea's prize money (including TV allocation) for reaching last 16 of Champions League was €32m, while Fulham only earned €10m for reaching the final of the Europa League. Love your blog, read every week, great post, blah, blah, blah ..... What I really want to ask is what you thought of last night at the Emirates? COYR !!!!!!!!! I have a question concerning amortisation. Let's say a player was signed for £20 million last summer and signed a short two-year contract at that time. If he signs a new five-year contract after one year of his original deal, wouldn't this mean that half of the amortisation (£10 million) would be part of the accounts for 2010/11 while the rest would be split into five parts (£2 million/year)? It might be something of a gamble, as you can't guarantee that a player will sign a new deal at the right time, but wouldn't this be a possible way of reducing costs for the first few years under the new regulations? Sign players on short contracts before the new regulations take effect and then sign new, longer, contracts later to reduce later amortisation? Yes, that's technically correct, though I'm not sure that many clubs did actually sign players on such short-term contracts last summer. Given that the 2010/11 accounts are the last ones not included for FFP, they don't really have an opportunity to do so now. The other issue, of course, is whether players would be happy to sing shorter contracts. Absolutely brilliant read - one of the best articles I have read in the last few years. Quality - can't wait for your next article. I have a different angle on this, say Liverpool have the opinion that they won't qualify for the Champions League no matter what so decide to deregard the FFP rules and sign say £80m of players in 2 years time in the knowledge that Man U, Chelsea, Arsenal and maybe City will be sticking to their budgets trying to keep within the European contraints. Okay, granted Pool won't make Europe but mightn't that be a price to pay if they have a competitive advantage in the domestic league? Also would the next available champions league spot go to a team below 4th when a team (or teams) in one of those positions cannot compete due to these rules? 'though the suspicion remains that this could instead be a last throw of the dice in order to win the CL in the next two seasons' spot on! I also suspect that Roman would want to win the CL first and then see what to do with the club after that.possibly he will just lay low and try to remain in the CL after that coz they owe him too much so he can't just leave. my best bet on fair play would be if all the big guns of europe unite and agree to follow the rules,then the likes of chelsea,mancity would have to comply or the big guns would threaten to form a break away league F1 style. In a case where a player carries a large amortisation figure, Torres at 9 mil/jr, would it be beneficial for the club to extend that player's contract to lower their annual amortisation and stretch it out? Lets say player X was bought during the summer of 2010 for 100 million and signed a 5 year contract, 20 mil/yr amort. So in the summer of 2012, their remaining amortisation would be 60 million. By signing a new contract for 5 years, it would drop the annual amort. to 12 mil/yr (or 8 mil/yr savings). Or am I missing some part of accounting 101? Thanks, and great job on the article. "First we came up with a long-term business plan, with the football club as the focal point and other businesses, such as holiday companies and fitness chains, supporting the football club. So that gave us a solid financial footing." Sound very interesting stuff, the way the club is run. Any chance you could write a post about them? As a Dane I can tell you that FC Copenhagen dont publish their accounts for the football part. It is all included within the holding Company "Parken Sport & Entertainment" which as you mention also consists of fitness chains, holiday companies and the Danish National Arena "Parken". The holding company, however, presented some horrible figures last fall which showed a loss of £26 mio. The entire organization was acutally close to bankruptcy and only a deal with their bank saved them. The bank helped PS&E with a plan to save the organization and the situation is again stable. This fiscal year PS&E expect a profit in the range of £10 mio where their CL adventure accounts for app. £ 13 mio. Så they are widely dependent on qualifying in CL. Great article, as ever, but as has been raised above, it's doubtful that Chelsea can afford to replenish their squad, and keep to FFP. They missed a trick in keeping the team together for 09-10, in my view. Should have taken that bid for Terry from Man City, and moved Drogba and/or Lampard too. That double came at a steep cost in my view. Loved the article, very detailed. Could you answer for me, if the accounts of Fordstam limited are taken into account, what would stop Abramovich transferring a profitable company e.g. Sibneft into Fordstram, Im sure Fordstram, would then be profitable. Can chelsea be seen to make a profit from also selling oil as well as football shirts? Speaking of FC Copenhagen, I'm wondering whether you've ever looked into the finances of Scandinavian football in general, specifically the widespread suspicion that a lot of the money that moves around does so without appearing on any accounts. have you ever considered writing sth about a club becoming independent of its owner? chelsea becoming independet of abramovich or like in germany hoffenheim becoming independent of hopp as recently announced? i would really enjoy reading such an article (especially regarding hoffenheim) because of the very controversial discussing its been going on regarding FFP. As I get older and less able to play the game I find myself becoming more and more interested in the business of football and your site is a treasure trove. I hesitate to suggest topics for you to write on (after all this is your hobby - none of us are paying for this!) but I'd be fascinated to see a piece on Rangers predicament. They are classic "Big Fish - Small Pond - Poisoned Water" material! Hi Swiss, i remember you did a similar piece transforming man city's finances and that looked easy too. I have to say though that standing back from the detail I find it hard to believe that it is realistic for a high achieving star based team stuck at £210m turnover for 4 years to suddenly leap like a salmon to £250m pa in sales, especially in what will is an increasingly competitive market. Intuitively it just doesn't sound right and i think the naming deal is definitely suspect. I also can't figure out how its feasible to just knock £14m bonus money off the wage bill unless the team is underperforming (and losing income) or players bonuses have been bought out? I also can't see how £14m player trading profits can be a sustainable option for a team that's not spending and is ageing and question really whether they do spend £10m pa in qualifying youth development expenditures. Against that though, you haven't allowed for a fall in player amortisation off the existing player pool which looks likely given pre 2011 spending of circa £100m over the past 4 years seems nowhere near enough to keep player amortisation at 2010's £37mpa amortisation. 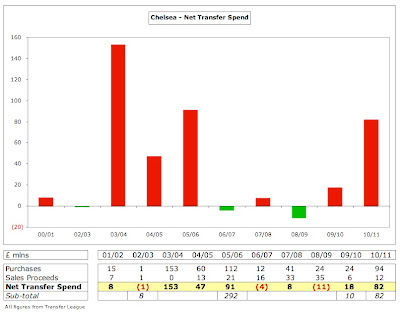 Overall, I think the challenge for chelsea is to keep earning either £210m or £250m pa and not spend more than £120-160m on wages (allowing £100m for net player trading and amortisation and other costs) as their's is a buy in strategy that relies on big name transfer activity. Actually, you do not need to use your intuition on the revenue growth, as most of it is already in the bag. The new commercial deals (Adidas £8m, Samsung £4m) are contracted, while the higher ticket prices have been implemented (£3m). Similarly, the new TV deals are in place for the Premier League (£7m) and Champions League (£5m). I agree with you that the naming rights (£10m) is far from a fait accompli, but that still means that £27m of the projected £37m revenue growth comes from done deals. Bonus schemes can be changed every year, but even if Chelsea's were unchanged, it would pay out less, unless their on-pitch success matches last season. Profit on player sales is almost impossible to estimate, but I don't think that it's unreasonable, given that this year's figure of £13m comprises one veteran plus two youngsters. 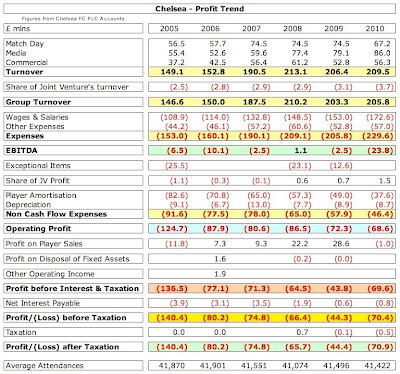 In the 3 years preceding 2009/10, Chelsea's profit on player sales was £9m, £22m and £29m, i.e. an average of £20m a year. I have indeed tried to be conservative with my assumptions on amortisation, as my guess is that adds and drops will cancel each other out. 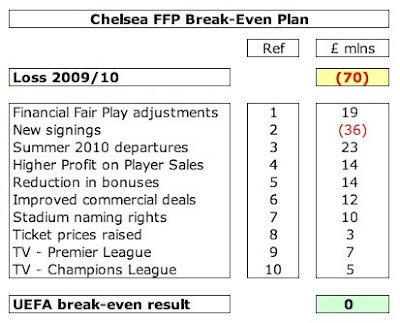 I think that the point I wanted to make is not that each individual estimate was 100% accurate, but that it was not so impossible for Chelsea to meet the FFP break-even target as most had assumed, especially as most (not all) of the required steps had already been taken. Excuse usingf this topic to ask a related question but have you been watching the goings on at Glasgow Rangers and the latest news that the potential owner will increase the £5M a year he has promised to inject to pay for players. How does this sit against FFP, especially if Celtic win the title reducing Rangers football earned income. Posting it here as it's the piece that's maybe closest to the topic I'll ask about. The other day, now almost forgotten in the haze of Manuel Neuer's more or less confirmed move to Bayern, I read an interview with KH Rummenigge, on the state of finances in football. It was short and glum, but in it he mentioned something interesting; He said Platini had said that 11 of the 32 teams that played the current CL-campaign, would not have met the FFP requirements (if they had fully implemented I guess, but it wasnt more specific). As leader of the ECA that's worked with Platini on this issue, i consider Rummenigge a credible source. Some of the russian and ukrainian teams have rich owners partly funding the party I think? How about United? They are running at a loss for now, but I'm not sure about how much of it is FFP-related, such as their goodwill amortisation etc. If you had the time to answear this, I don't know - maybe it would even be an idea for a piece? - it would be appreciated. Is there a reason I can't grasp why my question keeps disappearing? Swiss Rambler, now that Chelsea have, finally, released their accounts for last season, we see that revenues have essentially flatlined for four seasons in a row, despite the big increases in the Premier League TV rights in those years. One question - what date do Chelsea use for their year end, May 31st or June 30th? The reason I ask is that Chelsea didn't sign their new manager AVB until June 2011, yet his 'transfer fee' to Porto of €15m is charged to last year's accounts. Presumably, this means the accounts are for the year end June 30th, as otherwise this transaction should have been put in the accounts for 2011/12 and therefore would have been taken into account for purposes of FFP.